Over the last few months there has been an increase in the level of violence between the ruling MPLA and UNITA supporters in Huambo and Benguela. These two provinces are electoral battlegrounds of extreme political symbolism for the two largest national political parties. Sparse coverage in the media and a lack of dialogue across society regarding this increasing tension foreshadows a climate of mistrust amongst citizens and growing fear with regard to the upcoming elections on August 31, as well as its aftermath. Maka Angola brings to light some recent incidents so that the public can be better informed about current focal points of tension. Supporters from both the MPLA and UNITA, and especially their leaderships, share a burden of increased responsibility in promoting political stability and maintaining peace. Three serious incidents took place in the province of Huambo in just two days. On July 16, a group of MPLA militants attacked a convoy of UNITA militants with machetes, sticks and stones, in the Ndumbo sector of Lépi commune in the municipality of Longonjo. According to UNITA’s spokesperson in Huambo, Emanuel Malaquias, during the ambush, MPLA political activists set fire to two of the 10 motorcycles of the convoy and injured three UNITA members. A fourth has gone missing. In turn, the UNITA supporters retaliated, using similar weapons, and injured four MPLA activists. UNITA was attempting to reinstall its office in the said location and, though it managed to hoist its flag, this was burnt the next day. Two days before, on July 14, at about 4pm, around 50 MPLA members, armed with machetes, sticks, stones and the like, attacked a UNITA delegation at the entrance to the Mbave commune, in the municipality of Tchicala-Tcholoanga. UNITA was attempting to reinstall its local office there. According to several eyewitnesses, the administrator of Mbave, Abel Chico, personally commanded the attackers, while Lucas Junjuvili, the municipal secretary of UNITA, led his supporters. The confrontation resulted in injuries to seven UNITA members, including the secretary for organization of the municipal committee, Cambumbanje, who was hit in the head with a machete. Members from the ruling party set fire to three motorcycles that were part of the convoy of five vehicles and various motorcycles. Eight people on the MPLA side were also injured. Emanuel Malaquias, the secretary for information of UNITA in Huambo, stated that political activists from his organisation confirmed the death of two MPLA members at the scene, as a result of serious injuries. He also reported that a third MPLA support had allegedly died the next day in Huambo’s Central Hospital. MPLA sources and local authorities refused talk about the incident, which was then consigned to secrecy. The pitched battle went on for four hours, finishing around 8pm, due to the personal intervention of the municipal commander of the National Police and the administrator of Tchicala-Tcholoanga, Luísa Ngueve. They “advised UNITA to leave the area and cancel the event”, informed Emanuel Malaquias. On July 11, UNITA had delivered documentation referring to the event it was planning to hold, directly to the mayoress of Tchicala-Tcholoanga, to the local commander of the National Police and to the office of the State Intelligence and Security Service (SINSE). However, the MPLA provincial leadership, as well as local authorities, remain silent on the event, particularly on the alleged death of three participants. 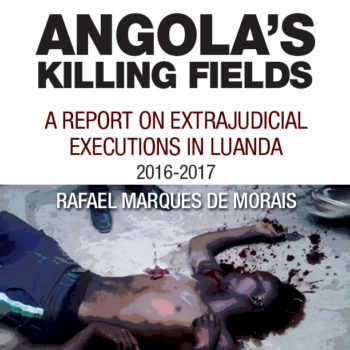 Maka Angola is proceeding with its investigations in an attempt to identify all the victims. On July 14, there was another altercation between MPLA and UNITA militants in the village of Vila Franca, in Alto-Hama commune, in the municipality of Londuimbali. There were no reports of serious injuries or damage to property. Confrontations between UNITA and MPLA supporters in Capupa commune, in the municipality of Cubal, resulted in two fatalities and an undetermined number of injured. So far, official sources have remained silent on the incident, which occurred on July 12. According to local witnesses, skirmishes broke out when MPLA activists tried to prevent a UNITA rally from taking place. Officers from the National Police stationed in Capupa did not confirm the deaths, but eyewitnesses revealed to Maka Angola that two MPLA militants were seriously injured in the fight, and died later. According to statements made to Maka Angola by Armando Nunda, one of UNITA supporters involved in the clashes, his group held a police officer “in custody” for an hour. This police officer was among the MPLA activists who launched the first attack on their political rivals, using machetes, sticks, bottles and stones. “When we saw the [MPLA] group charging at us, with the policeman among them, we captured him so that we can’t be called liars afterwards”, said Armando Nunda. According to the activist, “he [the policeman] was not beaten. We just kept him for proof of his involvement in the action”. When police reinforcements arrived from headquarters in Cubal, UNITA leaders handed the officer back to his superiors. Statements given anonymously by some of the aggressors, prior to the incidents, indicated that the MPLA supporters were given direct instructions by the administrator of Capupa, Estevão Tchipeio, who reactivated the defunct civil defense militia to impede political events by members of the opposition. Local sources confirmed that, in a meeting with MPLA supporters, that administrator Estevão Tchipeio promised to “wear a skirt” if UNITA succeeded in installing itself in Capupa. On July 13, the governor of Benguela, general Armando da Cruz Neto, summoned the provincial secretary of UNITA, Alberto Ngalanela, to discuss the incidents. After the meeting, the governor went to Capupa to take a close look at the situation. As a preventative measure, he sent ahead a whole company of the Angolan Armed Forces, along with helicopters. In addition, a significant number of National Police officers and resources, including a Rapid Intervention Police unit (PIR) also joined the mission. A team of journalists accompanied the governor as well. “There is a drought in Benguela, and in this region, there is almost nothing growing. Our personnel brought their own food. We even slaughtered two cows in Cubal and brought the meat with us”, she said. According to the UNITA leader, after the visit, “the governor told us he had given direct orders to enforce a tight separation between MPLA and UNITA supporters. He didn’t go there to educate the population to be tolerant”. As a means of containment, the PIR set up a security cordon to keep MPLA activists inside the town. Meanwhile UNITA activists were forced to remain outside the town, under the protection of National Police officers, to maintain public order. In spite of the tense atmosphere, the rally took place last Saturday, presided over by Márcia Lucanda. During the event, MPLA activists tried to invade the zone reserved for the UNITA rally, and were prevented from committing more acts of violence by members of the PIR. UNITA members attending the rally came armed with machetes, axes, sticks and stones, claiming they were for “self-defense”. The provincial secretary of UNITA, Alberto Ngalanela, took the occasion to condemn the growing wave of political intolerance in the country. “UNITA will strive for an inclusive democracy. There is no justification for killing in peace time”, said the politician. Meanwhile, a police source in Capupa revealed that an investigation into the incidents was to be opened, and that perpetrators would face criminal charges. In the same location, on April 9, eight individuals duly identified as belonging to the defunct Organization of Civil Defence (Organização de Defesa Civil, ODC) broke into the home of a UNITA politician, Manuel Lourenço. They beat his wife and kidnapped him. Two days later, local residents found Manuel Lourenço slumped and dying by the roadside, eight kilometers from his village of Caipumba. His whole body showed visible signs of violent torture. Coincidentally, the National Police arrived at the scene shortly thereafter, and transported him to hospital. He was dead on arrival. The National Police arrested four of the kidnappers, but there is no information that the investigations have proceeded. At the time, the National Police publicly declared the death as the outcome of a family dispute. In addition to Capupa, the commune of Kasseque, about 70 kilometers (43 miles) from the municipality of Ganda, was also the scene of incidents. On the June 20, conflict broke out when a group of more than 100 MPLA activists attacked a convoy of 86 UNITA members that was traveling to the said location for a political event. “When they stopped in the village of Kalongolo, four kilometers from Kasseque, to mobilise the local population, they were attacked by a group of MPLA members, who set upon their political rivals with iron bars, sticks and stones”, Alberto Ngalanela said at the time. Tiago Eurico, a member of UNITA’s Youth League (JURA), was hit with a machete on the left arm, suffering the loss of two fingers. Martinho Vitãyi, the municipal secretary of JURA, was attacked with stones and suffered serious head and chest wounds. He had to be taken to hospital. In turn, UNITA militants fatally wounded an MPLA militant who, according to several witnesses, died at the scene and was evacuated by his companions. Information unconfirmed by the MPLA indicates that a second militant died in Benguela’s central hospital, where he was admitted with serious injuries. In Kasseque, just as in Benguela, authorities maintained silence and did not comment on the occurrence of fatal victims.